To celebrate the 2018 Winter Olympics, Leica has collaborated with Swiss Olympic gold medalist snowboarder Iouri Podladtchikov to produce the Leica Q Snow. "As a brand ambassador, it's a fascinating feeling to have inspired a special edition of a camera, but I also see it as an enormous responsibility," said Podladtchikov. "White -- for me, that also means 'carte blanche' -- it's up to you. It's time to get creative." Highlights of the special edition include the front cover of the camera made from premium cowhide leather in pure white that gives the special edition its name and gives the user an exceptional grip with a luxurious touch and feel. The edition is strictly limited to only 300 units worldwide, each of which bears a special serial number. Like the Q from which it is derived, the Q Snow features an aluminum top plate carved from a single block and baseplate and control dials all anodized in a crisply bold silver color. Podladtchikov's design concept also features a new hot shoe cover made from aluminum, for an all-encompassing silver styling when viewed from above. The camera will retail for $5,395. In celebration of the Winter Olympics, Leica Camera presents a new special edition of its renowned high-performance compact camera with full-frame sensor and fast prime lens: the Leica Q 'Snow' by Iouri Podladtchikov. This limited edition has been created in collaboration with Swiss Olympic gold medalist and world champion half-pipe snowboarder Iouri Podladtchikov, who conceptualized the unique design of the camera. The Leica Q 'Snow' by Iouri Podladtchikov is based on the silver anodized version of the Leica Q, with an aluminum top plate carved from a single block and baseplate and control dials all anodized in a crisply bold silver color. The design concept also features a new hot shoe cover made from aluminum, for an all-encompassing silver styling when viewed from above. The highlights of the special edition include the front cover of the camera -- a unique premium cowhide leather in pure white color that gives the special edition its name and gives the user an exceptional grip with a luxurious touch and feel. The edition is strictly limited to only 300 units worldwide, each of which bears a special serial number. In the words of the passionate Leica photographer, Podladtchikov says: "As a brand ambassador, it's a fascinating feeling to have inspired a special edition of a camera, but I also see it as an enormous responsibility." His choice of color has deep meaning to him: white is of course is the color of snow, but as the accomplished snowboarder and photographer puts it, "White -- for me, that also means 'carte blanche' -- it's up to you. It's time to get creative." The Leica Q 'Snow' by Iouri Podladtchikov is presented as a set, complete with a case in soft white leather and an exquisite color-matched leather carrying strap. 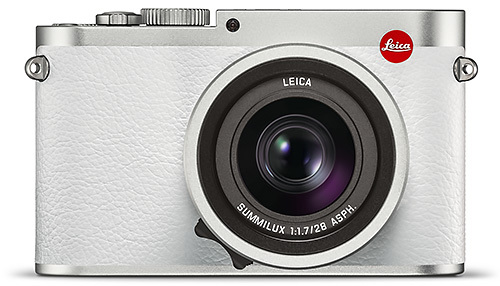 It will be available beginning March at Leica Stores, Boutiques and Dealers worldwide. The technical specifications of the Leica Q 'Snow' by Iouri Podladtchikov are identical to those of the standard model Leica Q, complete with its fast Leica Summilux 28mm f1.7 ASPH. lens, high resolution electronic viewfinder, integrated WiFi and minimal yet logical controls and menu system -- all with ideal and comfortable ergonomics. These features blend into a whimsical synergy that guarantees users get a camera which takes top quality pictures in any lighting scenario and get a clear view of their subjects and settings while having the freedom to download and share their pictures remotely while on the go. The Leica Q makes a perfect everyday companion for both the most discerning photographers and casual enthusiasts alike -- and with the Leica Q 'Snow' by Iouri Podladtchikov special edition, the camera has a newfound bold sense of fashion and style. Known around the globe by snowboarding fans for his amazing accomplishments at the Winter X-Games, FIS Snowboarding World Championships and Winter Olympics, Iouri Podladtchikov is also a passionate and accomplished Leica photographer. At the age of 29, Iouri Podladtchikov has already published two books of his photography and will soon be opening his own studio. He has been shooting Leica cameras since his early '20s.